Everyone who starts a business blog does so with the best of intentions. They’re going to write regularly, give away valuable content to their readers, and really engage with them. Instead, what you get is a blog that ends up being another news release platform for you, and the last original content you wrote was 10 months ago. That’s okay. 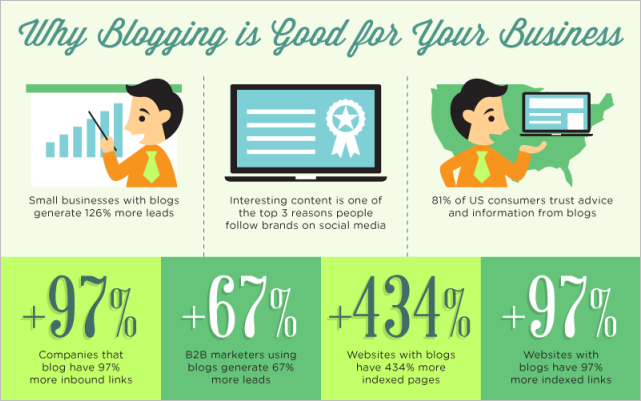 Business blogs are the hardest marketing channel for business to keep updated. According to Andy Crestodina and Orbit Media’s Blogger Survey, they found that over 10% of bloggers post “at irregular intervals”. 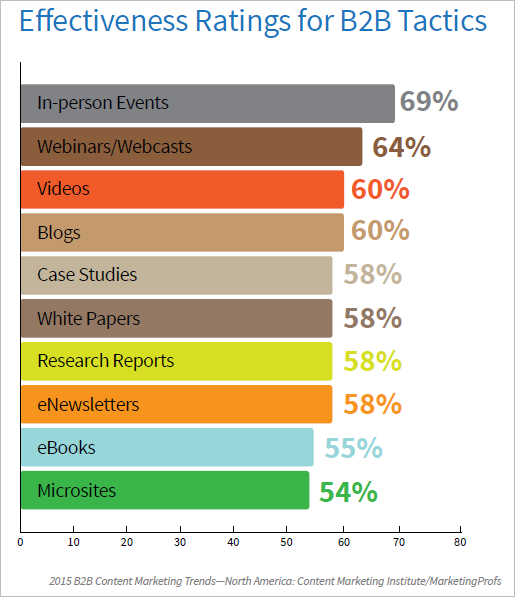 (This study encompassed everyone from business bloggers to SMB business owners who blog for themselves.) Content Marketing Institute found that 80% of B2B businesses use their blog for marketing purposes in 2015, a steady increase over the last couple of years. Yet those same B2B marketers found that their business blog wasn’t an effective tactic for them, with only 60% of them citing their blog in effectiveness ratings. 1. Be consistent. Write regularly. That’s why business blogs often fail, because they’re neglected after a while. Keep the momentum going after that initial excitement. 2. Use images. It makes your posts easier to read. That’s why infographics are so popular. 3. Make it easy to read. Literally. Choose a good font and colours on your business blog. Give it an easy-to-read layout on all devices (aka make it responsive for mobile devices). Use good business blog practices like lots of lists, numbered lists, white space, etc. This goes double for longer posts. 4. Educate, don’t sell. Business blog readers don’t want to be sold to, so limit the disguised ads and press releases. Write informative, educational content first. That doesn’t mean you shouldn’t or can’t link to your sales stuff, just make it subtle. Link out to that content instead. Always include good calls-to-actions (CTAs), regardless of your business blog focus. You want readers to continue reading. 5. Remove barriers to your content. Aka Make It Easy For Your Readers. That means removing the number of clicks it takes to get to your content or information. Don’t hide everything behind a gate. 6. Be a storyteller. The best bloggers tell a great story with their words. So regardless if you’re a professional writer, read the masters, study the bloggers you admire, then emulate them. (Geek Confession: I do this too. All the time in fact.) Do your best to tell your best stories all the time, to the best of your abilities. 8. Invest wisely and seriously. Blogging is a long-term strategy, and in order to get a good ROI, it needs the best tools and writers you can finance. That means hiring writers internally or working with a freelancer like me. That means attending in-person events to find out what your market is talking about. That means investing in some software tools that will help your blog succeed. If you’re not ready for that type of investment, walk away now. 9. Show off your successes and wins. Create short-form case studies as blog posts and talk about how existing customers overcame their obstacles with your products. We all love a good story with a happy ending, and the case study is the quintessential example of this. Plus there’s the added bonus of readers identifying with the showcased customer, which means if you solved that customer’s issue, you can probably solve the readers’ too. 10. Have fun with your blog. Even in the B2B realm, a business blog can be fun. Eliminate the jargon and techno-babble. Use the same words your readers use as you tell the story. Show off some pics of your staffers letting loose at a trade show or other fun event you attended. 11. Recognize others too. Whether it’s by inviting industry leaders and experts to guest blog for you, or by writing about customers, employees, and sometimes even competitors, those positive vibes have a way of reflecting back on you. 12. Don’t back down from a fight. I don’t mean this literally, but use your business blog to be contrary and swim against the current. Talking about the same things as everyone else is boring, and doesn’t make you stand out. Taking a different stance or perspective from your competitors makes you stand out and earns you more readers and shares. 13. Interact with your readers. This is a reminder that a business blog is not a one-way street, but rather, a conversation. Respond to comments on the blog and feedback on the posts on social media. 14. Crowd-source your content. Keep up the steady stream of content on your business blog through crowd-sourcing. By that I mean writing posts that answer your reader’s questions, publish guest posts from respected authors and thought leaders in your industry or market. Get your CEO/CMO/CIO to write a regular posts as well. It doesn’t have to all be up to you. This is especially true if the business blog is just one of your regular work activities. Spread the work around and give everyone an investment in making it succeed. Have you been blogging with a purpose? Share your stories of business blogging in the comments. I’d love to hear how you’re doing it.